Freelancers know how tough it can be to bid for a project. Show off your skills, include sample works, and articulate how much your effort is worth. You know someone will get the project at the end of bidding but how can you make sure it's you? The employer will award the project to the best freelancer for the job. This is where an effective bid comes into play. As a candidate, it's vital that you put your best foot forward when pitching yourself to prospective clients. Another way to showcase your professionalism and prove to the client that you are serious about their business is by listing down milestones in your bid. Proposing Milestones: What can it do for freelancers? Freelancers can now enumerate upfront the well-defined tasks they will execute to complete the project in the “Proposed Milestones” section. Proposing milestones is your way to give employers complete details on what you plan to deliver, the expected timeframes, and the amount you charge for each completed milestone. This way, you can gain the employers' confidence because it will be clear to them how you will tackle their project. Are you an employer? Let proposed milestones find you the right freelancer! Some employers who have yet to try working with freelancers might think the latter will not complete the project to their standards. But there could be 10, 20, or even hundreds of excellent freelancers waiting to work on your project! If you find the right freelancer whose skills match the tasks for the project, you know it can be done right. Proposed Milestones will give you confidence in your shortlisted freelancer even before awarding the project. 1. 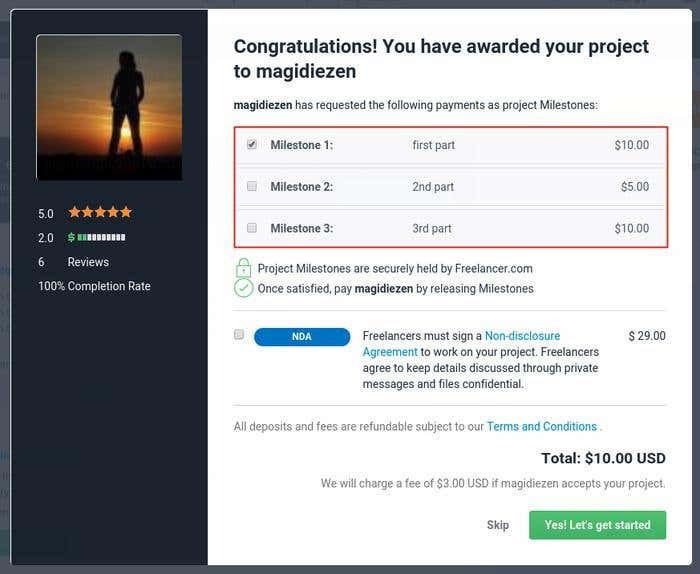 After placing your bid and writing your proposal, go to the Proposed Milestones section and describe each task/milestone you will deliver for the project. Be specific to avoid miscommunication between you and the employer. 2. Indicate how much each milestone costs. You should have an appropriate price for every milestone. In this way, you can get paid after completing a task and you don’t have to wait for the entire project to finish. The breakdown prices must add up to the price of your bid on the project. 1. Employers can view all the bidders on their project under the Proposals tab. Clicking the sub-tab All Proposals will display all the bidders while clicking Online will display bidders who are online upon the employer's checking. 2. Tick the thumbs up icon to shortlist the bidder or the thumbs down to hide or remove. 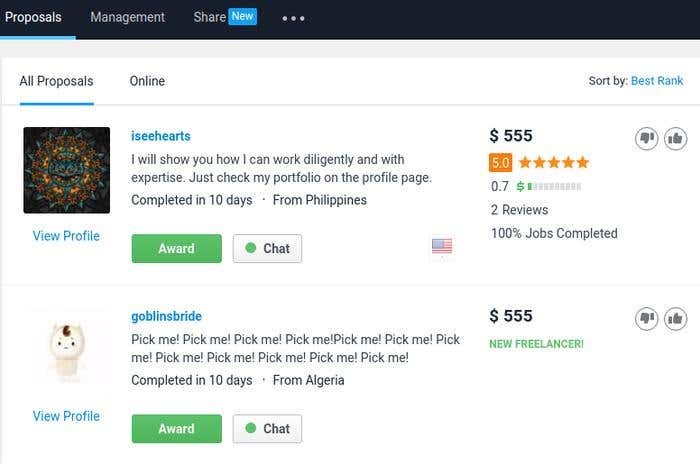 If you already want to hire a freelancer, click on the Award button. To discuss details before the award, choose Chat. 3. After proceeding, you will see the bid breakdown. Think of your project’s priorities while reviewing the freelancer’s milestones. 4. Tick the Milestone/s that you want before awarding the project. By clicking 'Yes! Let's get started', you will be prompted to deposit payment for the milestone/s which will then be released after every task done. Why are you going to love this feature? According to company data, freelancers are 21% more likely to win projects if they show a bid breakdown. The freelancer receives faster and more frequent payments because of each detailed milestone and the employer is completely confident in the freelancer’s work. Bidding for a project? You know what to do now. Looking to hire a freelancer? 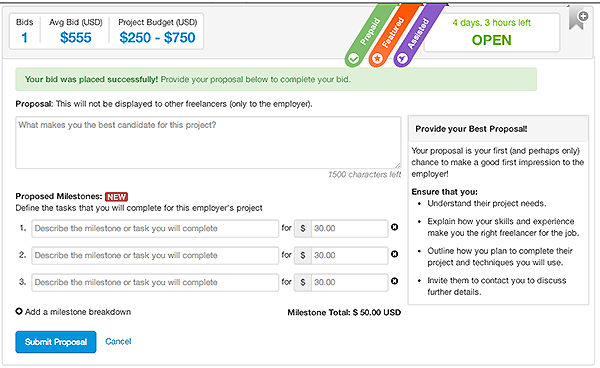 Check the Proposed Milestones and pick the best freelancer for your project!